Yes, it is possible to recover deleted files from your Recycle bin in Windows or the files from your Trash, if you are woking on a Mac. How? Let’s explore this topic today where you don’t have to be scared after deleting something important from your computer or mobile devices. I am sure you must be really excited to know that something exists in the software industry that can save a day or may be more. Disk Drill for Windows and Mac is one such awesome bit of software that will give you the immense control over your deleted files. You can get them back in a jiffy. But first just remember few things that can help you a lot in such situations. 1. Don’t overwrite on your lost files. Your operating system doesn’t delete files in a actual sense, it only frees up the space by marking it available. Those deleted files are still there and if you look properly with the help of Disk Drill then its possible to get them back. The first you should do when something important gets deleted is that you stop working on the system and connect your hard drive from an external source or a docking system. Disk drill’s free version gives you the ability to recover upto 100MB of space and with a pro version you can do more. Its that easy to do. With disk drill you can also run a free scan on your hard drive for checking all kind of file segments – the bad and the good ones that store data after deletion. After the scan is completed and you get to see those recovered files, we recommend you to save them separately on a separate hard disk or USB drive so that you can use them later. Disk Drill will have sure you get recover sucessfully and with its filters you can see those essential file types and lots more when you need them. 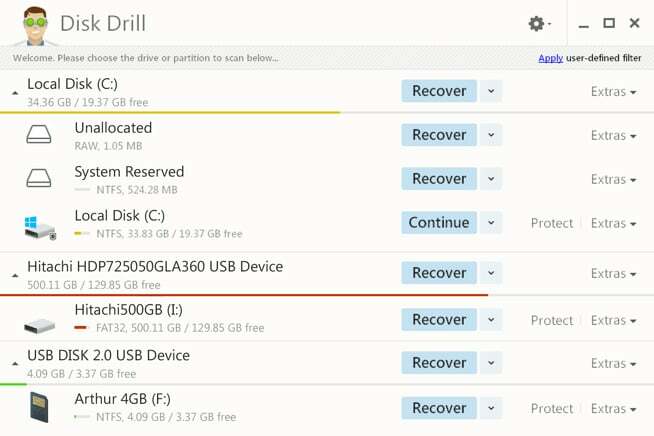 Disk Drill has something special in the name of Recovery Vault that enables you to track all the deleted files, and if you find some, you can recover it by selecting option of “Undelete Protected Data”. So just remember to have this Recovery Vault activated. This will work in both the cases of FAT32 file systems and NTFS file systems, so no more worries now. Disk Drill will find the files that have been deleted and it will list all of those in a window that you can preview. Just select them and give a path where you want these recovered file to go. That’s it your destination folder will then be filled up with those all important files of yours. I hope this review of Disk Drill will let you download at least their free version and if you find it useful you can always upgrade to a premium version that offers a lot. The freedom of using your PC without fear of getting files deleted will be vanished for forever. Very Informative Article though. Is there any way to recover deleted files which we deleted directly by Shift+Delete from our system? If yes, please mention.